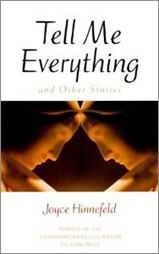 Like a long song with an unchanging sad refrain, the 14 stories in Hinnefeld's first collection are melancholy, varied and yet very much of a piece. Some, like "Echo Guilt," evoke an Edward Hopper-like solitude in which the narrator stands back from her world as if from a painting, trying to figure it all out. In others, such as "The Slow and Painful Demise of the American Family," Hinnefeld conveys a sense of how close to the surface old angers and horrors linger, and of how we torture ourselves in essentially transient lives with the hope of permanence. Whether she shows them in a silent summer pool in a glade in Northeastern Indiana or trapped in New York squalor, Hinnefeld's female protagonists tend to cling to the same traditional, domestic fantasies and are confused when their choices leave them lonely and embittered. "I can't stop dreaming of empty buildings," reflects the woman in the title story, an intimate portrait that explores the self through landscapes of dreams, suburbs, and cities. Intelligent and moving, Hinnefeld's debut should attract discerning readers. Joyce Hinnefeld's strong debut collection portrays in spare, haunting prose the lives of women of different ages and backgrounds, all of whom feel trapped in various female roles. "What Alma Knows" is a particularly successful story about a self-described "spinster" aunt, ignored by her relatives; unhappily, her attempt at revenge during a Christmas party winds up endangering the one family member she cares about. "Echo Guilt" subtly describes a wife who increasingly loses all ambition as her husband's professional success grows. The yuppie narrator of "The Slow and Painful Demise of the American Family" cannot quite accept her destiny—to marry her boyfriend and become a housewife in the suburbs—but fears any other possibilities. In "Speaking in Tongues," a teen-age girl deeply troubled by her sexuality fantasizes about Jesus and Mary Magdalene. . . . Interestingly enough, the best entry, "Stories about Miranda," has the only male narrator in the collection. He is Rumer Rutledge, a 21-year-old flasher who is urged by a hospital psychiatrist to talk about his mother, Miranda, a fat, 45-year-old doll collector who never brushes her hair or changes out of her baby-doll pajamas. "The truth is," Rumer reluctantly admits, "Miranda herself is a pretty interesting story." And he turns out to be right. I'm dazzled by Hinnefeld's dexterity and insights. Her debut collection of short fiction is vigorous yet concentrated, full of surprises and still perfectly controlled . . . . These stories take as their starting point the precarious connections that bind women to women and women to men, and they go beyond these connections to explore the refuge of private consciousness. This is a beautiful and wise collection, with no wasted words.